What are Bullish and Bearish Flags? 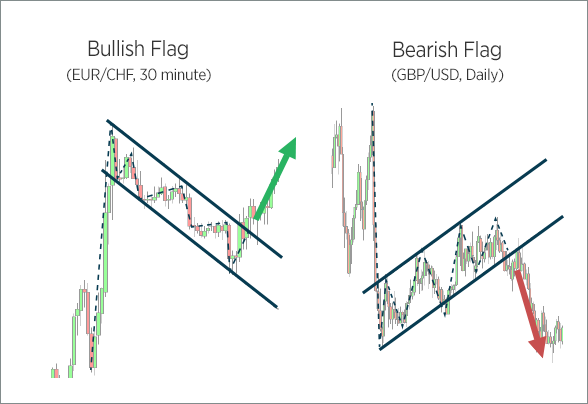 Bullish flags are formations occur when the slope of the channel connecting highs and lows of consolidating prices after a significant move up is parallel and declining. The trend before the flag must be up. Bearish flags are formations occur when the slope of the channel connecting highs and lows of consolidating prices after a significant move down is parallel and rising. The trend before the flag must be down. Why are Bullish and Bearish Flags important? Flags imply that the market cannot decide whether to break up or down. Once the flag is broken by the price, there may be a substantial move in the direction of the break. So how do I use them? Flags can be used to interpret large breaks in price. If the price breaks through the flag to the downside, there may be a large move down. Similarly, if the price breaks through the flag to the upside, there may be a large move up. We may use these to help identify trend or to confirm a Gartley or butterfly pattern. What Are Bearish and Bullish Markets? Learn about the difference between bearish and bullish markets with FOREX.com. Develop a thorough trading plan for trading forex.